Our fingernails (and toenails actually) say so much about our health. It is mind-blowing when you look at the references listed at the bottom of this article the number of conditions of the nails associated with hypothyroidism including Alunula (absence of the Lunula, the little white moons of the bed of the nails), Onychorrhexis (longitudinal ridging of the nails), Beau’s Lines (transverse grooves or depressions of the nail plate), Koilonychia (spoon shaped nail plates), Onycholysis (separation of the nail from the nail bed), Pterygium Unguis (thinning of the nail fold and spreading of the cuticle over the nail plate), Onychomycosis (fungal infection of the nail), Yellow Nail Syndrome, brittleness, slow growth, and thickening. 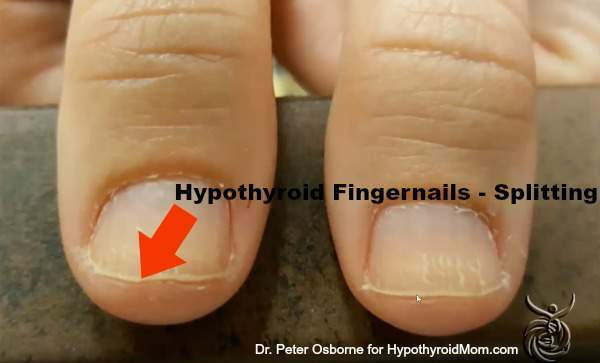 I first heard Dr. Peter Osborne describe the following common symptoms of hypothyroidism he notices in his patients’ nails and it got my mind racing. I dove into studies and books to figure out how low thyroid can affect even our nails. What the heck! Not even one part of our body is safe from hypothyroidism. The symptoms of thyroid problems often manifest in the hands and fingers. Some very common physical abnormalities can present in the nail beds and fingernails. 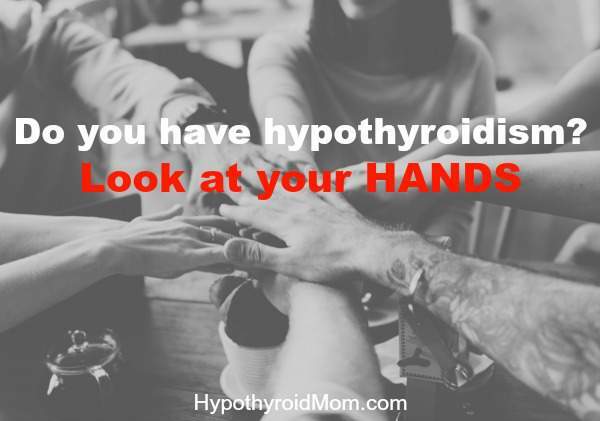 If you have these types of findings on your hands and also suffer with fatigue, hair loss (especially a thinning of the lateral eyebrows), low libido, dry skin, and unexplainable weight gain, visit with your doctor to have your thyroid evaluated. If you are being treated for hypothyroidism and have these symptoms, please too see your doctor in case they are an indication that you are not well treated for your condition. Here I have a nice image of the classic fingernails of a patient who had been priorly diagnosed with a hypothyroid condition. Now there are a number of classic things we can see here. The first is around the cuticles. You can see the really jagged and rough edges. You see it on both sides here. 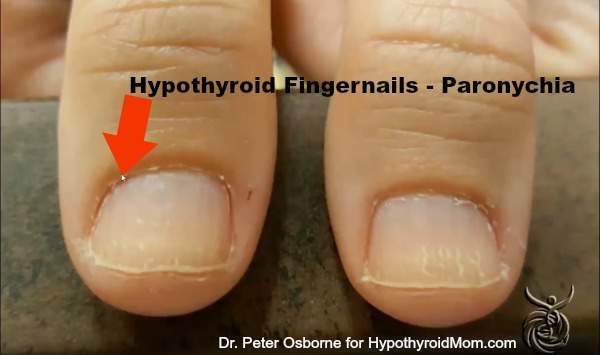 The formal name for this is Paronychia and it is a very very hallmark sign of hypothyroidism, meaning low thyroid condition. This type of symptom nutritionally is often times also linked to a protein deficiency. Interestingly enough, one of the major forms of amino acids (amino acids are the building blocks for protein) responsible for helping thyroid function is Tyrosine. Often times we will see a protein deficiency, and particularly Tyrosine deficiency, in patients that have low level of thyroid and it will present in the cuticles looking just like this, called Paronychia. 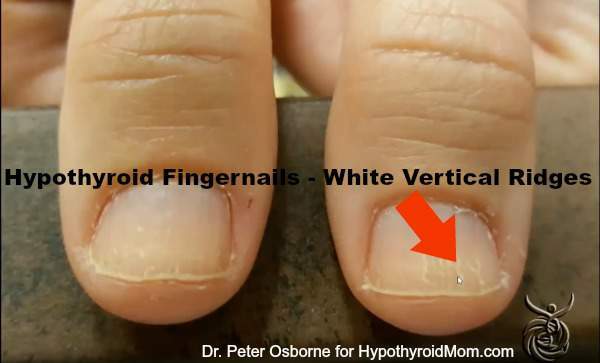 Another classic example of the thyroid fingernail is this white vertical ridging that we see on both sides in the nail beds. This is often times indicative nutritionally of a selenium deficiency. Now why is that important in someone that has a thyroid condition? It’s important because selenium is a mineral absolutely essential in the conversion of the INACTIVE thyroid hormone T4 to the ACTIVE T3 thyroid hormone. T4 has to be converted into T3. T3 is the thyroid hormone that communicates directly with your DNA and speeds up your metabolism and has all the wonderful effects we’re looking for in thyroid hormone health. Without selenium we don’t convert T4 to T3 very effectively and it will look like this often in the fingernails. So look at your fingernails and if you find these types of white spots very well it means you have a selenium deficiency. It also might mean you have an undiagnosed thyroid condition. If you are treated for hypothyroidism, it might mean you are not well treated for it. I would advise you if these are present on your fingernails to visit with your doctor and have your thyroid evaluated. One other thing you can see here in this image is the splitting at the tips of the nails. This is also very very common in people with a hypothyroid condition. Look at your fingernails and see if you have these types of findings. If you do, follow up with your doctor and have your thyroid fully evaluated. Dr. Peter Osborne is the clinical director of Town Center Wellness in Sugar Land, Texas. He is a doctor of chiropractic and a Board Certified Clinical Nutritionist. His clinical focus is the holistic natural treatment of chronic degenerative musculoskeletal diseases. He is an expert in the relationship that gluten sensitivity and food allergies play in chronic inflammation. He has helped thousands of patients recover from chronic painful conditions. Dr. Osborne is the author of the book No Grain, No Pain: A 30-Day Diet for Eliminating the Root Cause of Chronic Pain. Heymann, W.R. (2008). Thyroid Disorders with Cutaneous Manifestations. London: Springer-Verlag London Ltd.
Macura, A.B. et al. Nail susceptibility to fungal infections in patients with hypothyroidism and hyperthyroidism. Przegl Lek. 2005;62(4):218-21. Magee, D.J. (2014). Orthopedic Physical Assessment: Musculoskeletal Rehabilitation Series, Sixth Edition. Missouri: Saunders, an imprint of Elsevier Inc.
Sacchidanand, S. and Savitha, A.S. (2013). Nail & Its Disorders. New Delhi: Jaycee Brothers Medical Publishers Ltd. I was born with a nonfunctioning thyroid gland and from the age of 2, I took Armour Thyroid until they messed with the formulation a few years ago. It was no longer effective for me, so I had to change to NatureThroid, another brand of desiccated thyroid that seems to work, though I don’t think I’m getting the right dose. I was doing well on 113. 75 mg., but that and other dosages have been on backorder since the hurricane in Puerto Rico, where the factory is located. I can still get 65 mg., but to get the needed dosage I have to split pills in halves and quarters, which is a pain and probably not exact. I have never been able to take Synthroid with any success. Even with the Cytomel to get the T3, it was terrible. Strangely, most doctors insist that’s the only option for hypothyroidism. It’s not. In fact, when I was 9 years old, my pediatrician took me off any thyroid medication completely for a year. He knew my history, so I have no idea why he’d have done that. My parents didn’t know any better than to question his advice, and I lost an important growth spurt. I was one of the tallest kids in 3rd grade, but now I’m much shorter than I should be. Both my parents were tall, so I should be much taller than 5’ 1”. When I heard Dr. Holly died a while back, I hoped he was buried in a short coffin. You can also go to formularies for the desiccated thyroid, but it’s costly. It’s all very frustrating for someone who has lived with this problem her entire life. Doctors should make it easier, not harder. You have to shop around for one who is willing to work with you to get your best quality life with this disorder. For YEARS!!! I have tried to get physicians to listen. I am 70 and my hair has thinned so much my scalp shows through on top. My eyebrows are disappearing. I am SO FATIGUED! My mother (took) and both of my daughters take thyroid medication. The information, here, matches my symptoms completely. I am done being told it is all in my head! I have the same issues. I’m getting relief with high. Even while taking thyroxine for years the symptoms remain the same – nails crap, hair thinning (still), mood up/down, weight heavy & rising, fatigue worse, sleep interrupted and so on and so forth. See doctor tomorrow and will ask about Armour which apparently many find a better medication. We will see. Jan – Armour works great for me…synthroid did not…all it did was falsely alter my number to make it look like they were ok. Armour thyroid medication has made the world of a difference…I’m not always feeling 100%, but much much better. You may want to get your blood sugar levels tested as well. Also have the doctor test your liver and Vitamin D receptors. All these can effect your thyroid. If the meds aren’t working there is more work to be done. In my practice ,I find 80% of the females and 15% of the males coming into the clinic complaining of hair loss or thinning hair / eyebrows est. have Hyper or Hypothyroidism. The standard blood test T-3 T-4 or T-4 free, in many cases does not show any deficiency. These patients still exhibit all the classic symptoms. I have found the essential Amino Acid Tyrosine as reported by Doctor Osborne has been very helpful. I am also Injecting PRP (blood derived circulating Stem Cells and Growth Factors) this can result in the hair growing back. John Satino (Clinic Director) Hair & Scalp Clinic Clearwater Fl. Do you have any recommendations for doctors who treat thyroid related hair loss like you do, in or around Fort Lauderdale? How does one tell if there reverse T3 is high? What should reverse T3 be? As I assume the majority of everyone here is female. I find it interesting, yet very troubling, that so many have had to endure a doctor ignoring pleas regarding symptoms, and knowing our own bodies. Though my diagnosis of Hashimoto’s came some time ago I can never forget the anguish it caused me dealing with a physician who was callous and wouldn’t listen. I remember crying as I lay on my bed, believing that I must be sick with a very serious illness, knowing something was wrong. I had had repeated bouts of a flu like illness and was severely depressed. The Dr I was seeing told me there was nothing wrong with me except that I was just fat. With every visit my TSH always came back within normal limits, on the low end, but still within normal parameters. After the repeated experience of being humiliated, and told I wasn’t really sick I left in tears, knowing this wasn’t right. Next when I could gather my bravado I made the decision to call back to the Dr’s office. I wanted to see my Dr, and not her partner, who also happened to be her husband. He was the Dr who wouldn’t listen to what I was telling him and I said I would find another doctor rather than see him again. This is when I had the realization that doctors are offering a service, period. If it’s not meeting your needs find one that does, because they are not gods, though some do have a God Complex! That’s when everything changed. The doctor was immediately angry when I shared with her my experience of dealing with her husband, and partner. She quickly apologized, saying he had been her resident and thought she had taught him better than that. Then upon examining me she called for a TSH and an antibody test. Part of my medical records included that my Mother and Grandmother both had thyroid disease, which I reiterated. The antibody test results came back off the chart, they were so high. She told me she thought I had thyroid cancer and to take heart because it was one of the most curable cancers. I was immediately scheduled for an ultra sound using a radioactive isotope marker. I left feeling stunned, but relieved that finally someone was hearing me. The results were diagnosed as Hashimoto’s with no cancer present. I’ve been on Synthroid, with occasional adjustments ever since. We are our own best advocate. Finding a doctor who will listen is a challenge often times. You know your own body and don’t ever let anyone tell you otherwise. Good luck to all this New Year, and here’s to better health for us all. Thank you for your words of wisdom and experience,thanks to me reading your post,I’ve decided to go get a check-up to see if something like this could also be wrong with me.Ive not felt like myself in a long while.Thank you and God bless you and yours. Sincerly, Troubled..
Hi, I just want to remind you to get all 3 types of thyroid tests. My daughter was only deficient on one of the tests. Her t3 wasn’t converting to t4. Her tests kept coming back normal but she knew something was wrong. Eventually the gave her the other tests and figured out what was going on. I am so happy you finally were diagnosed! I was just recently diagnosed with hypothyroidism. I knew something had to be wrong with me Nothing felt right. Weight gain aches pains no energy depression. Within 4 pills I was happy and laughing again. Im just into week two and feel hopefull! When I gave birth to my first child, the civilian Dr. who we paid cash to in order for me to get better care than from an old military hospital, turned out to be one of the worst excuses for a obgyn I could have gone to! My baby was born on Dec. 22, 1968, which must have been a busy time for him, as he did not remove the afterbirth and caused me to be sick for most of the years since! I was 21 1/2 yrs old and didn’t question why I had brown smelly discharge after the delivery of my first child! Three months later my beautiful hair started falling out by the hundreds! I called him and had blood work taken to check my thyroid, which he said came back normal! I had put my health care in the hands of a Dr. who had no respect for military members, I found out much later! He had the nerve to ask me why I hadn’t told him that my husband was a green beret?!! He said he would have spent more time with me!! Guess maybe he would have removed the afterbirth! Said his nephew was a green beret too! Because of this awful man, Dr. Jerome S. Weingarten, my life and health became hell— with no help from the many Drs I sought care and diagnosis from! My blood work and even a scan were all said to be “borderline or within normal range! Finally at age 33, my pulse began beating at 120 beats a minute, so a new scan was done showing severe Graves’ disease! Surgery and many years of trying to determine a correct dosage of Synthroid insude!! For a while I had less loss of hair until the dosage no longer worked. I will go to a new endocrinologist in a few days in hopes of saving what’s left of my hair and mind! I pray for an answer! Please consider naturally dessicated thyroid, it is natural and not a synthetic thyroid hormone replacement. Check out StopTheThyroidMadness website to learn more. Many people do NOT respond well to synthetic T4 but do really well on this other source. Good luck! Wow, learned so much. My nails have not looked good for years. I have Hashimotos and take Synthroid . I fired my endocrinologist and now see a homeopathic PA. She ran extensive labs and I’m now taking Iron, prescription Vit D, and Berberine. I also did a sleep study. Apparently I don’t get enough oxygen while I sleep. I now wear a custom mouth piece which keeps my jaw forward and allows higher oxygen levels. I have Fibromyalgia , Raynauds and RA. I feel so much better since I changed doctors. What dosage recommendation for Seleniim would you recommend? I do hv mild vertical nail ridges. I had left lobe removed Wednesday and do not yet hv CA diagnosis but University Endo surgeon didn’t believe it was CA. I do not hv Duabetes at 69 but it is in family. I hv NA fatty liver with ok blood test numbers. My metabolism and adult daughters as well is practically non existent. We both take 100mcg Levothyroxine. What is your opinion about taking Selenium. You can get selenium naturally by eating Brazil nuts. Eat 2 Brazil nuts a day, according to my Naturopath. We don’t need more than two, he said. I’ve heard others say the same thing. I’m an RN and believe I’m hypothyroid. My T3, T4, and TSH are always within normal range. However, I have several signs and symptoms of hypothyroidism. I’m able to tick every one of the nail signs you mention!!! My neck has even been swollen for years, and an ultrasound indicates no problems. Does anyone have any suggestions? Any natural remedies? I had half a thyroid removed in 1995 my thyroid level were in the normal range since then. In 2014 I was having tests for a colon surgery and during those tests my Dr. saw something in my lung xray so he ordered a pet scan. My thyroid lite up with cancer but my thyroid blood tests came back normal. So, if I were you I would insist on an ultra sound, CT scan with Contrast, I would be persistently get your Dr. onboard. Have you had your anti bodies checked? For five years various doctors told me my tests were fine. I thought I had Alzheimer’s My husband and I are preparing for the worst, when my friend recommended a “kinda crazy” doctor who diagnosed me with Hashimotos. Like you I had symptoms and my tests were fine until I convinced my endo to to a thyroid antibody test which was positive; he still refused to do anything. I went gluten free and changed endis. My antibody test dropped to zero, I lost weight, and I felt 100 percent better. Hi – I am new to this Hypothyroidism. Twice I had labs run and they were normal, the latest doctor I went to checked my antibodies and caught it. Actually he was pretty certain with all my symptoms even before my bloodwork came back..He suggested a gluten free diet. I can tell the difference in how I feel when I stick to gluten free and I am losing weight without really trying. My labs also were within normal limits, but I have too many symptoms of hypothyroidism to ignore. I had requested a full thyroid panel but internist only ordered TSH, T4, and T3. Should I go to an endocrinologist now? I tried to schedule with one before but couldn’t without a diagnosis, so I had labs done, but I still don’t have a diagnosis. Suggestions for next steps? Have you tried an internal medicine physician, that’s who caught mine. I have found most endo to be useless in helping with hashimotos and or hypothyroidism. I would look for a naturpoath, or a functional medical doctor. I suffered for years because my doctor only tested my TSH. I found a naturpoath and she ran the antibodies for hashis and I was positive and also hypo. The first thing I would recommend is a change in diet. Cut out gluten, dairy and soy. Paleo is better and AIP Paleo is the best step. It helps tons for many people. I would also recommend self education. It has been key to my recovery. There is a great face book group hashimotos411 check it out tons of great information. Visit a natropathic Dr. , mine were always normal also. They do more accurate testing. I take a supplement and it seems to help. Good luck! See a functional medicine doctor for your thyroid issues. They actually treat YOU not just read a piece of paper. My life is SO much better after switching 2 years ago. Have your doctor check your vit. D levels, and keep checking your T.S.H. Every 6 months. It took 2 years of checking mine after I had symptoms before my lab values changed but when they did, they were very bad. I have been taking synthroid for 10 years now, I was diagnosed with Hashimotos and thought I would die before it was found. What do I do?!? I was diagnosed with Graves Disease 3 years ago and had RAI. (My endo said “once may not be enough”). He released me to my internist who documents both hyper AND hypo thyroidism. I’ve been on a very low dosage of name brand Synthroid for 2 years. Lately, I feel as though I’m falling totally apart! I’m stressed — but NOT depressed! — gaining weight despite dieting and my body is quickly showing signs of issues. My labs say I’m “in range.” In January of this year, I had a softball-sized growth removed from my ovary. I’ve never been on hormones (I’m 59) and I just feel like NOBODY in the medical field is listening which only adds more stress and anxiety. I know something just isn’t right but what I don’t know. Soon, I’m sure I’ll be developing headaches from knocking my head upside the proverbial medical brick wall! DO NOT GIVE UP SEARCHING FOR ANSWERS. Doctors don’t listen to women who know that something is not right because we know our bodies. They simply don’t. I’ve asked for years about my thyroid because all my female relatives have been on Synthroid for issues. My TSH was always “fine.” FINALLY a new doctor, new PA listened. She sent me for an ultrasound of my thyroid….I have Hashimoto’s, multiple nodules, a goiter (doesn’t show on the outside…I always thought they did! ), and cysts. Referred to an older endocrinologist who told me I’d probably had all this for TWENTY FLIPPIN’ YEARS!! Am now on Synthroid and will have another ultrasound in October. I also see a cardiologist for MVP and arrhythmia. He wanted to implant a monitor in my chest to monitor my arrhythmia…I declined. Since I’ve been on Synthroid, that has greatly improved. I’d asked the cardio about my thyroid, too. Change doctors if you need to. Find someone who will listen. I am so grateful that I finally did! BTW, thank you for the info on fingernails. Now I know why mine look like that! All my previous doctor’s PA would do was take a clipping biopsy and send it in to check for a nail fungus….which, of course, was negative. I also have hypothyroid, and a large nodule. I started reading everything i could, and found that diet and reducing toxins ste two very important things we can do . And we have control over that. There are minerals that are lacking in our diets ,when you balance them things start functioning better. Selenium was one that helped me a lot. My Hair quit falling out and has filled back in . My nails have small moons now where there were none. Thank you for the information. I’m in the same boat n I’m tired of being misdiagnosed. My dr told me that I have hypothyroidism n prescribed Levothyroxine n left it at that. I’m slowly learning to take matters into my own hands. Your knowledge is so appreciated! Please give me the name of the vitamins you are taking. Thank you. Please test before supplementing with most vitamins. Selenium can become toxic and you need to do a selenium RBC test before supplementing. Some vitamins like C are fine in high doses and we just pee out what we don’t need. Read Dr Steve Gundry’s book the Plant Paradox I have found it is a revelation for my health. At first you this guy is nuts!!!! Then he starts to explain band it all comes together. Ask your doctor to do a fasting insulin blood test to see if you are insulin resistant that goes along with the cystic ovaries and can cause weight gain and you to be apple shaped and no matter what you do until you fix insulin resistance issue nothing will help.Insilin resistance is not diabetes but can be a precursor to getting type 2 diabetics when you are older. Get your antibodies tested. Sounds like Hashimoto’s to me. I had low thyroid but would have “Storm” episodes where I was suddenly high thyroid- weak with heart palpitations- felt like I was dying. I’m not “there” yet but I finally began to feel better when I left gluten behind & started taking Armour Thyroid which has T4AND T3. Synthroid which has a synthetic T4 only is never enough. For about 10 years now I will have 1 to 2 unexplained episodes a month or heart palpitations. I have 10+ symptoms of Thyroid dysfunction but labs come back within “normal” range. My TSH was 1.5 something and my T3 and T4 in the lowest percentile but still within what they call normal range. No heart Dr could ever figure out what’s wrong and I’m seriously feeling like what you’ve said could be it!